Whether you actually get snow or not, you can still enjoy building wintery LEGO creations. 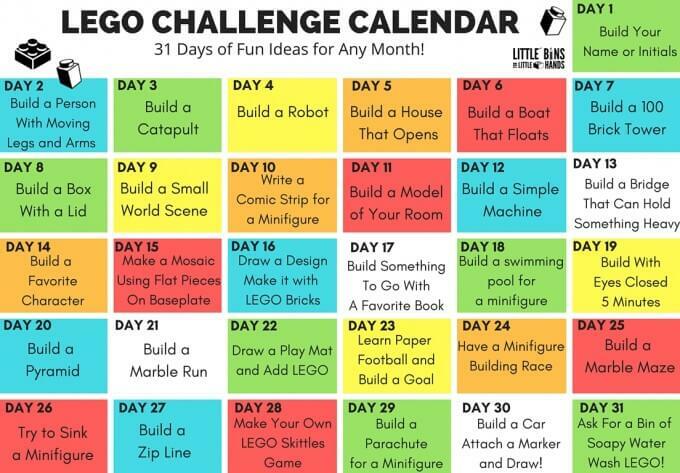 LEGO is awesome all year round, and seasonal LEGO challenges are perfect for the kids! Our winter LEGO building activities are perfect for all the holidays during the winter season as well as general fun themes like snowmen and snowflakes. What will you build first. We have tons of fun LEGO learning ideas for kids. LEGO provides not only hours of neat creative and imaginative play bit also numerous opportunities for learning. 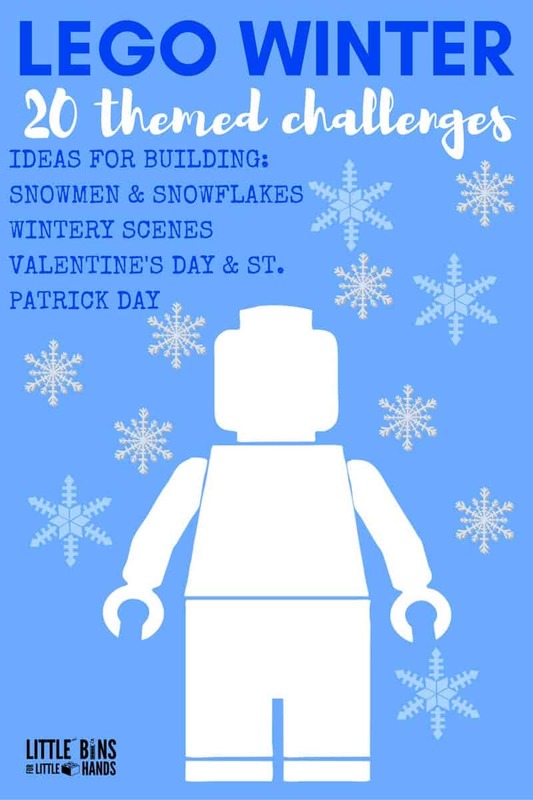 Our winter LEGO building ideas are more like prompts to get you thinking and give you a few ideas to roll with. I am excited to work out some of these too with my son. We have done a few already and you can click on the blue links to find out more! The best part of these winter LEGO building ideas and challenges is to make it your own and have fun. Pull out the bin of LEGO bricks and get started! 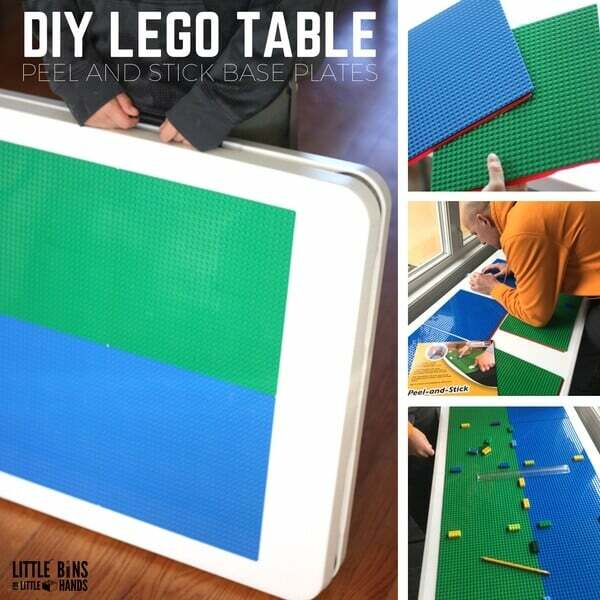 Check out our newest DIY folding LEGO table. It’s perfect for so many spaces. 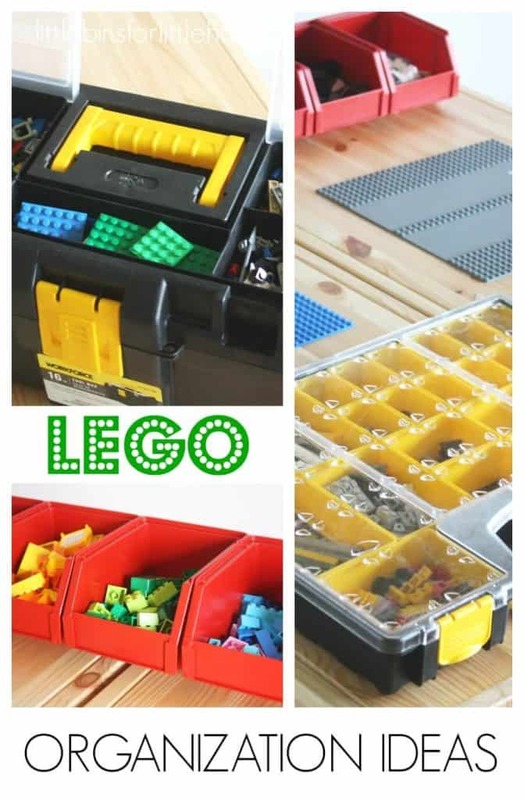 You might also enjoy checking out how we organize and store our LEGO bricks and figs. 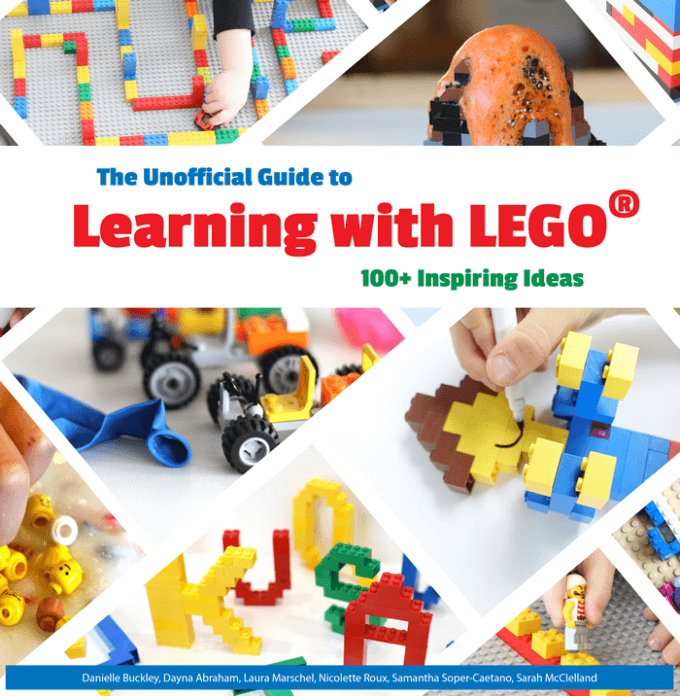 Did you know we also co-authored The Unofficial Guide To Learning With LEGO? We did! Over 100 cool LEGO learning projects for kids ages 3-8ish. Cool ideas to supplement lesson plans and anytime play! Check it out with all our Fun LEGO Learning Ideas! 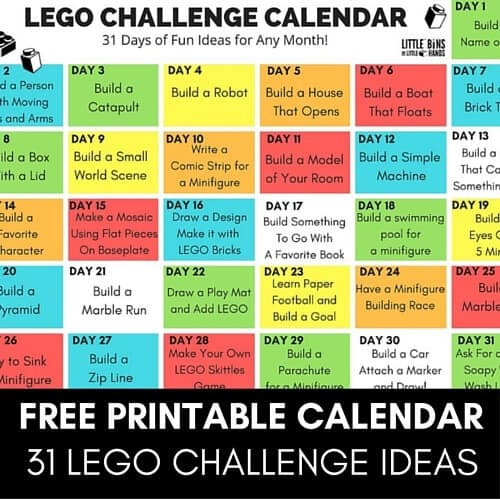 Not into winter building ideas, check out our free printable 31 Day LEGO Challenge Calendar for anytime! HERE THEY ARE! WINTER LEGO BUILDING IDEAS! Remember the links in blue are clickable so you can see more! If you are checking in with us, and it’s before Christmas, check out our DIY LEGO Advent Calendar to make at home. Tons of great ideas including snowflakes and snowmen! Make sure to bookmark it for last year too. Christmas Scenes Building Ideas shows off some of our more challenging building ideas from the advent calendar above. Try building some simple LEGO Christmas ornaments too! Build LEGO numbers to represent the new year. Make a LEGO ball to ring in the new year. St. Patrick’s Day is still considered to be a winter holiday although it’s so close to spring! Bored and stuck inside this winter? There are so many ways to play with LEGO, and I hope you take a few of these winter LEGO challenges and give them a try! If you come up with a great LEGO winter activity, let me know! I love to get new ideas from my readers. 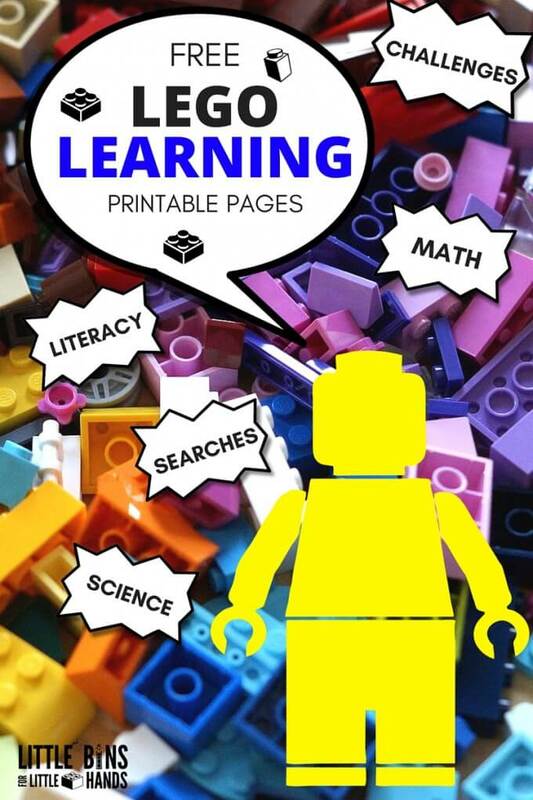 Click on each of the photo below to print out LEGO robot coloring pages, I SPY, math, challenges, literacy, and more! Amazon Affiliate Links for Your Convenience. See disclosure. Ummm…. not sure why you have a ‘pin it’ button on the blog when you don’t allow pinning…. It goes wacky a lot!